14 gauge Hook on Trays with dual wire drop handles and open or closed fronts in two sizes 9" x 36" x 3" high and 15" x 36" x 6" high - see accessories. 1-1/2" square tubular base frame. Slotted 12 gauge channel uprights (slots on 3-1/2" centers). 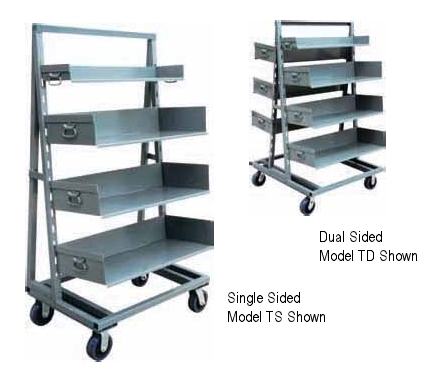 Bolt on casters, 2 swivel & 2 rigid, for ease of replacement and superior cart tracking — see specifications.